Mr. D TV is my weekly video series where I give advice to teachers on just about any topic. If you have a question you'd like me to answer, email me (teachforever@gmail.com). If you like the video, check out last week's episode or my YouTube channel for more. See you next week! I can't think of a more compelling argument to stay in school than this. UPDATE: A much-needed 'c' finally appeared on the sign today, after a very long week of shool. At one of my favorite local haunts, patrons play a lot of Jenga. Recently, people have started to deface (some might say enhance) the ubiquitous wooden blocks with all sorts of messages. There are directions you might give to someone for a dare ("Kiss the person to your right! "), analog Twitter updates ("Johnny wuz here 1-25-10"), and grammatically questionable declarations of love ("Cap'n -n- Tennille 4 eva"). As usual, I saw an immediate, easy application to the classroom. Let's use this idea to make a fun review for standardized test and end-of-year exams. 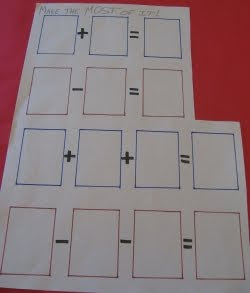 Cover the top and bottom of each block with vocabulary, short problems, clues for a larger puzzle, etc. You can even make them into "flash" blocks, with a term or picture on one side and a concise definition on the opposite side. In an algebra class, each block could contain linear and quadratic equations. 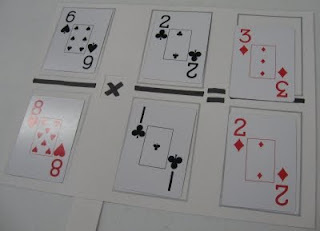 Students could write down each equation and work with them after the game ends--each student would have a random and (mostly) different set of problems to work with. They could alternately quickly name some key piece of information about the given function, like the slope and y-intercept of the linear functions, before placing the blocks on top of the stack. In a social studies class, each block could contain vocabulary words that students would have to write down. After the game, students would define and illustrate the key terms, then share them within their groups to build a complete study guide. In a chemistry class, each block could contain individual elements or reactions that students have to explain and/or solve. In an English/language arts class, blocks could contain the elements of a story that students could later put together into an original story. Each piece could instead have authors and works studied during the year, and the kids would have to identify key information, write reflections, etc. The possibilities are truly endless. 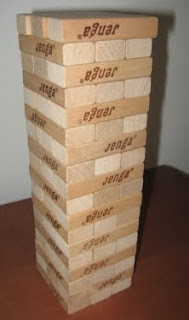 If you could get several Jenga sets, each one could cover a different objective or focus on things in a different way, so that you might have to rotate the sets around so that each group of students would be exposed to everything. If you had an extra untouched Jenga set available, I would love to see students create their own educational Jenga game. In a perfect world, you could get funding so that each group of students would work on such a project, but this is not the case. What you could do is have one extra set available and reward students who did the best work on the earlier game to create a new version that would help other kids. Why Jenga? Like Uno, students can't help but being fully engrossed in this simple yet addictive game. Even if you don't see yourself using this idea, Jenga is a game that should be in every classroom. I also must insist that you buy only real Jenga sets. The generic knock-offs are pure crap: the blocks aren't even the same size, and they don't fit together tightly the way the original does. In this case, it's worth the extra couple bucks to get the name brand. Have you tried or seen anything like this using Jenga before? Do you have some ideas for your subject or grade level? Are you wondering how to pull this off in your classroom? Share your thoughts and questions in the comments. Due to the success of my Spring Break sale on downloads of my book Ten Cheap Lessons: Second Edition, I've decided to make the $2.50 price permanent. I've also dropped the price for the spiral paperback (seen in the picture) to $9.95, $2 off the price of the original. 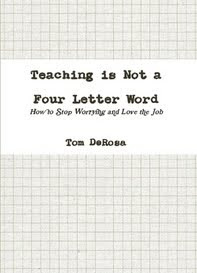 I've realized that it's more important to me to get the book into the hands of as many teachers as possible than anything else. As I've said time and time again, knowing that my lessons and ideas are being used to help hundreds, if not thousands, of students all across the country (and the planet) is why I do what I do. 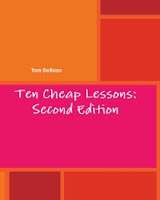 You can still find the first edition of Ten Cheap Lessons on Amazon, Barnes & Noble and elsewhere online, including some reasonably priced used copies. Welcome to the March 23, 2010 edition of the Carnival of Educators! Bellringers (Carol Richtsmeier) presents Shut Those Eyes posted at Bellringers. As Spring Break rolls around, Ms. R wonders why her yearbook staff thinks their assignments will just go away if they ignore them long enough. Mathew Needleman presents Independent Work Time: My Students Refuse to Work Independently posted at Creating Lifelong Learners. "My students just refuse to..." is a common refrain when teachers are struggling. Mathew's great post reminded me of a similar question I received from a teacher facing misbehaving students. Matthew Halpern presents Awesome. posted at Look at my happy rainbow!. This is my favorite blog, and this post is a perfect example of why. I implore you to read, then subscribe! Vagabond Teacher shares They Know What To Do posted at Into the Woods, explaining that the title contains the five words a substitute teacher never wants to hear. organized chaos shares the best plans... posted at Organized Chaos, sharing an awesome, inspiring story about trying to get her kindergartner to the school dance! Jane Goodwin presents Draco Dormiens Nunquam Titillandus posted at Scheiss Weekly. Mamacita learns some lessons about education from the Harry Potter series. EightFalls presents Managing Student Learning With Gantt Charts posted at EightFalls.com. The author borrows an idea from the corporate world: could we do better at being managers of student learning? June Tree presents How Would You Grade Your Money Management Skills? posted at The Digerati Life, saying "Here’s why we should teach money management and personal finance in schools." I agree! Robert Drummond presents Using Befuddlr in the classroom. posted at robert drummond's blog, noting "Highlights a great program - befuddlr and how it can be used in the classroom to support and review learning." Laurie Bluedorn presents Test Your Logic Skills posted at Trivium Pursuit. A little logic game to try out. Maria Clara presents Masterpiece or Ad? Take our Test! posted at Online Colleges.net. Great idea for introducing media literacy, consumer education, and of course art! Steve Spangler presents Build a Trap, Catch a Leprechaun for St. Patrick’s Day posted at Steve Spangler's Blog. This is a little late, but bookmark it for next year! Thank you for visiting! That concludes this edition. Submit your blog article to the next edition of carnival of educators using our carnival submission form. Past posts and future hosts can be found on our blog carnival index page. What Are the Myths About Math? [Math Mama Writes...] - Sue starts a very interesting discussion that you should contribute to! Homework Post #2 [Kiss My Asymptotes] - Speaking of a good conversation, JT wonders if he should have his students grade their own homework and contemplates a more effective way to give student feedback. FTC Enhances Consumer Website for Kids -This new, interactive website created by the Federal Trade Commission aims to teach kids about privacy and fraud. There's a lot of material you could use to build a solid consumer education and media literacy unit. Check out the Parents & Teachers page for more ideas. Final Call for School Security Officer Scholarship Nominations - The National Association of School Resource Officers (NASRO) has extended the entry deadline for the 2010 Wren Solutions School Resource Officer (SRO) Scholarship Award. 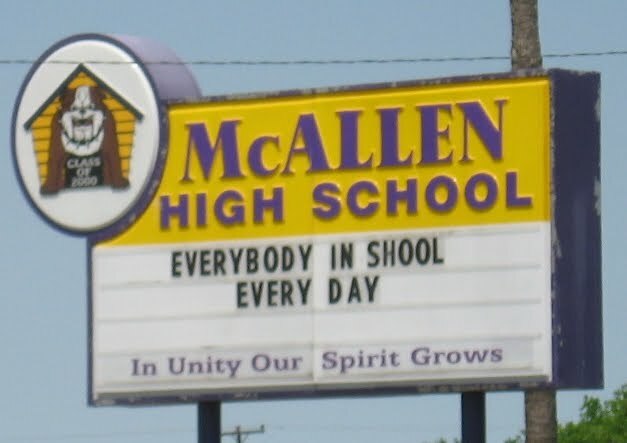 Nominations will now be accepted until May 1, 2010. This is a great way for them to extend their education. Read a guest post from Wren's school security expert, Bret Rachlin: How Teachers Can Help Make Their School's Security a Priority. Part of my responsibilities at the after school tutoring center I work for has been to create fun, educational math activities. 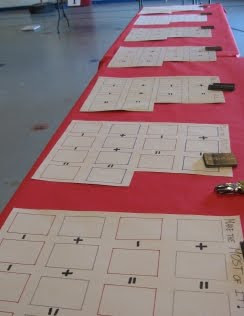 We use these activities for community "math fairs" where we play educational math games at nearby schools. 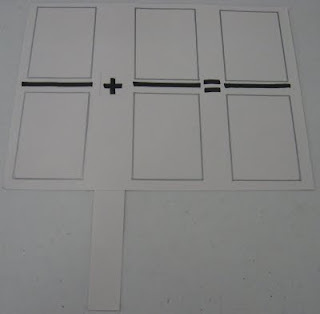 Recently, we held a fair for 5th and 6th grade students, so I designed an activity that would help them practice operations with fractions. The organizer is made of three pieces. The main piece is about 8.5" by 11", with a small square inch window cut out for the operators to show through. The operator strip is about 1.25" by 9", longer than the width of the main piece so it can be slid back and forth. Behind the strip is a slightly wider 1.5" by 8.5" piece taped to the main one, which forms a pocket for the operator strip to move. It's less complicated than it sounds. It's not so much of a game as an activity that changes each time you do it, depending on the cards you get. The goal would be to create at least one correct number sentence with each operation. 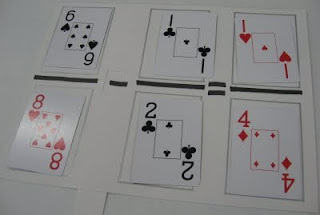 If you're using a standard deck, you can count all face cards as 10 and aces as 1 or 11. 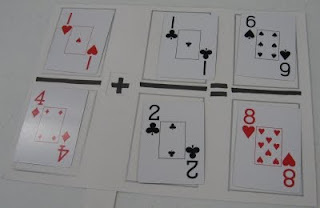 The alternative is to have jacks, queens and kings as 11, 12 and 13 and aces as 1 or 0. If you really want to raise the stakes, make red cards negative and black ones positive. You can of course do this without the organizer, and the idea's still the same. 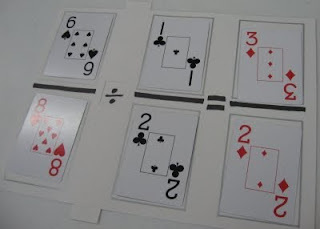 You can also use cards in a similar way to do basic integer operations, or incorporate a number line for practice with positive and negative integers. 2 Dead Economists In An Extreme Rap Battle [Consumerist] - Keynes vs. Hayek throw down over their economic theories. I'm waiting for Alexander Hamilton vs. Thomas Jefferson in a battle of nascent political parties. Extreme Word Problem Writing [The Number Warrior] - I'm all for new and exciting ways to engage students, but I think word problems can be more effective if they just make more sense and are a bit more relevant. These extreme questions are certainly interesting if not useless in the classroom, similar to those in the SAT parody book I reviewed recently. Printliminator Quickly, Easily Makes Any Page Printer Friendly [Lifehacker] - Save on ink, paper and copies with this handy tool. I've also shared similar resources here. Stop Overscheduling Your Children! [Wired: GeekDad] - Jenny Williams makes a case for giving your kids time to be kids. Faculty Meeting Pet Peeves [Sup Teach?] 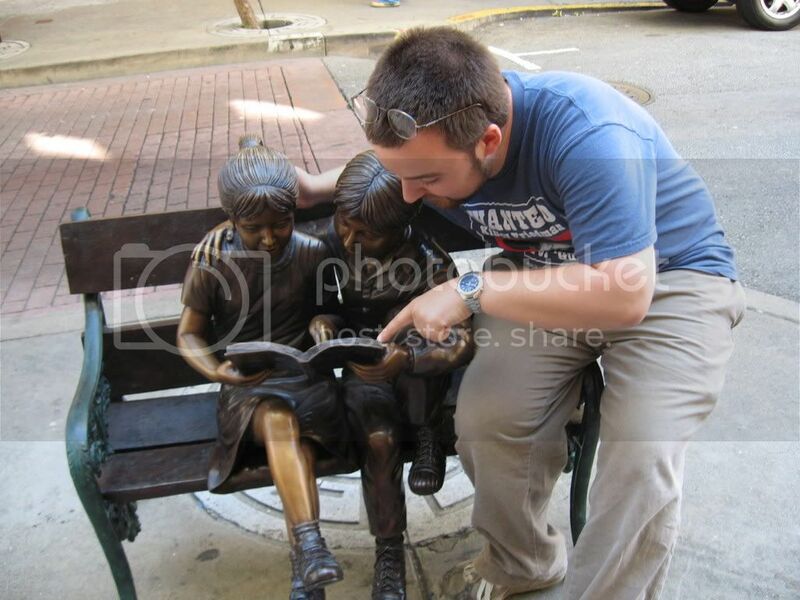 - They must have visited many schools I've taught in! Whose Job Is It Anyway? [Math Tales from the Spring] - Mrs. H makes an excellent point about graduation rates. In October, I shared my idea for the Ultimate Number Line Game as a kinesthetic way to teach number sense. Now I have a video of the game in action! The first half of this short clip shows the setup and explains the concept, and the second shows the kids enjoying the game. These students are in grades 2-5. We told them to play it like a relay (one throws the dice, the other moves to the right spot, then switch). If you've tried a version of this game and have pictures or video, please contact me so we can share it with everybody. When I first opened The BSAT Official Study Guide: 350 Questions You'll Never See on the SAT! by John Forster and Marc Segan, I expected a chuckle, or perhaps a polite half-laugh. When I started laughing out loud, I had to put it down for a bit so as not to scare the people around me. This book is really funny, and although you can't give it to a college-bound student who lacks a sense of humor (or has parents with that particular affliction), it would make a great gift for most others. This parody of SAT prep books is actually really similar to the structure of the test and legitimate prep books, although the content is obviously quite different. As with all good parodies, it's the degree of faithfulness to the original that makes it truly effective. It would certainly help a stressed out junior or senior relax before taking (or retaking) the test, which will help them do better and not psyche themselves out. Teachers could also use parts of this book to review test-taking strategies (carefully picking the questions to use), to reduce stress heading into a real test, and as a source of funny questions to tack onto assignments and tests of their own. It would also be helpful if you're interested in reliving and/or understanding what their high school students are going through, especially if it's been a while since you were in their shoes. Mathematics: Ashley is twice as popular as Brittany, but half as popular as Desiree. Camille is three times as popular as Desiree, but actually would love to have long straight hair. How much more popular is Camille than Brittany? C) Camille would actually love to have long straight hair. E) Is this math? That is so not popular! Sentence Completions: The freshman realized it was time to do his laundry when -------. Essay: Why aren't white people cool? Would it help if they could jump? These are admittedly some of the tamer entries, and I must again stress that someone who is easily offended will flip out over the content of this book. For everyone else, it's a great way to help calm someone gearing up for the SAT. Get The BSAT Official Study Guide: 350 Questions You'll Never See on the SAT! at Amazon. Read more about the book and the authors at BSAT World. Also, I'm giving away a copy of the book. All I ask is that you share your most hilarious and/or horrifying test taking experience, SAT or otherwise, in the comments below by midnight CST this Saturday, 3/6. Good luck! Here's the "Evolution of Mr. D" series I mentioned in the video. Mr. D TV is my weekly video series where I give advice to teachers on just about any topic. If you have a question you'd like me to answer, email it to teachforever@gmail.com. If you like the video, check out the last week's episode or my YouTube channel for more. See you next week!